In 2012, the ATLAS and CMS experiments at CERN’s Large Hadron Collider announced the discovery of the Higgs boson. The Higgs was expected to be the final piece of the particular jigsaw that is the Standard Model of particle physics, and its discovery was a monumental event. But more precise studies of it are needed than the LHC is able to provide. That is why, years earlier, a machine like the International Linear Collider had been envisioned as a Higgs factory, and the Higgs discovery set the stage for its possible construction. Over the years, instruments for probing the universe have become more sophisticated. More refined data has hinted that aspects of the Standard Model are incomplete. If built, a machine such as the ILC will help reveal how wide a gulf there is between the universe and our understanding of it by probing the Higgs to unprecedented levels. And perhaps, as some physicists think, it will uproot the Standard Model and make way for an entirely new physics. In the textbook version, the Higgs boson is a single particle, and its alleged progenitor, the mysterious Higgs field that pervades every point in the universe, is a single field. But this theory is still to be tested. The LHC collides proton beams together, and the collision environment is not a clean one. Protons are made up of quarks and gluons, and in an LHC collision it’s really these many component parts – not the larger proton – that interact. During a collision, there are simply too many components in the mix to determine the initial energies of each one. Without knowing them, it’s not possible to precisely calculate properties of the particles generated from the collision. Furthermore, Higgs events at the LHC are exceptionally rare, and there is so much background that the amount of data that scientists have to sift through to glean information on the Higgs is astronomical. The ILC, on the other hand, would collide electrons and positrons, which are themselves fundamental particles. They have no component parts. Scientists would know their precise initial energy states and there will be significantly fewer distractions from the measurement standpoint. The ILC is designed to be able to accelerate particle beams up to energies of 250 billion electronvolts, extendable eventually to 500 billion electronvolts. The higher the particles’ energies, the larger will be the number of Higgs events. It’s the best possible scenario to probe the Higgs. If the ILC is built, physicists will first want to test whether the Higgs particle discovered at the LHC indeed has the properties predicted by the Standard Model. To do this, they plan to study Higgs couplings with known subatomic particles. The higher a particle’s mass, the proportionally stronger its coupling ought to be with the Higgs boson. The ILC will be sensitive enough to detect and accurately measure Higgs couplings with light particles, for instance with charm quarks. Such a coupling can be detected at the LHC in principle but is very difficult to measure accurately. The ILC can also help measure the exact lifetime of the Higgs boson. The more particles the Higgs couples to, the faster it decays and disappears. A difference between the measured lifetime and the projected lifetime—calculated from the Standard Model—could reveal what fraction of possible particles—or the Higgs’ interactions with them— we’ve actually discovered. “Maybe the Higgs interacts with something new that is very hard to detect at a hadron collider, for example if it cannot be observed directly, like neutrinos,” speculated John Campbell of Fermilab’s Theoretical Physics Department. These investigations could yield some surprises. Unexpected vagaries in measurement could point to yet undiscovered particles, which in turn would indicate that the Standard Model is incomplete. The Standard Model also has predictions for the coupling between two Higgs bosons, and physicists hope to study this as well to check if there are indeed multiple kinds of Higgs particles. 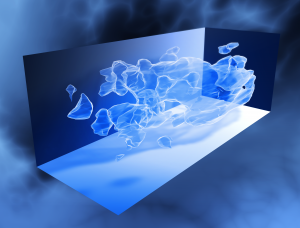 accelerating expansion caused by dark energy, as well as the mysterious dark matter that still allows matter to clump together and galaxies to form. There is speculation about the existence of undiscovered mediator particles that might be exchanged between dark matter and the Higgs field. 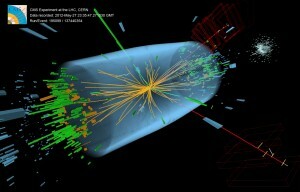 The Higgs particle could be a likely gateway to this unknown physics. With the LHC set to be operational again next year, an optimistic possibility is that a new particle or two might be dredged out from trillions of collision events in the near future. If built, the ILC would be able to build on such discoveries, just as in case of the Higgs boson, and provide a platform for more precise investigation. The collaboration between a hadron collider like the LHC and an electron-positron collider of the scale of the ILC could uncover new territories to be explored and help map them with precision, making particle physics that much richer.